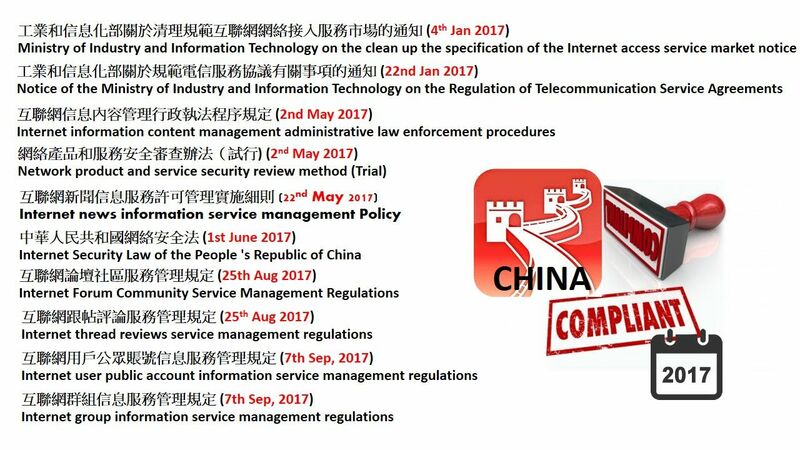 The new regulations on China’s Cybersecurity Law on November 2018 grant China cyber security agencies (the legal authority) to conduct remote testing of any Internet-related business operating in China. Their authority is possible to copy and share any data that government officials find on the system being inspected. 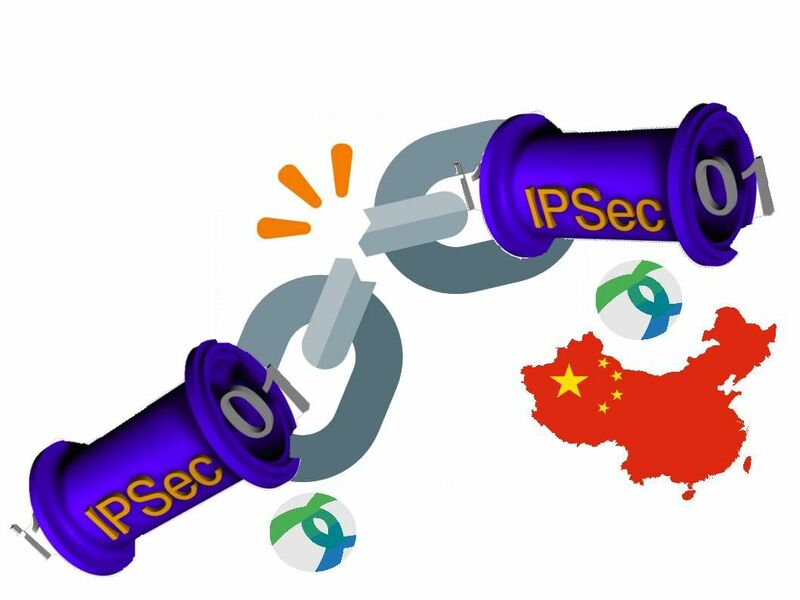 Conduct on-site or remote inspection of network security defenses taken by companies operating in China. Check for prohibited content in China. Record the safety response plan during the on-site inspection. Copy any user information found on the system being inspected during a live or remote inspection. Perform a penetration test to check for vulnerabilities. Perform a remote check without notifying the company. During the on-site inspection, two members of the PAP (Chinese People’s Armed Police Force) had the right to enforce the procedure. The Fall of the Berlin Wall on November 9, 1989. A physical wall who goal to isolate the culture and humanity looks never appears in the world again. However we are living in the modern of ages. We unintend to transform our culture and daily life to a digital world. Furthermore the operation of the world also under digital mainbrain custodian. If you looking around, seems Berlin has not falling down. Don’t be childish! 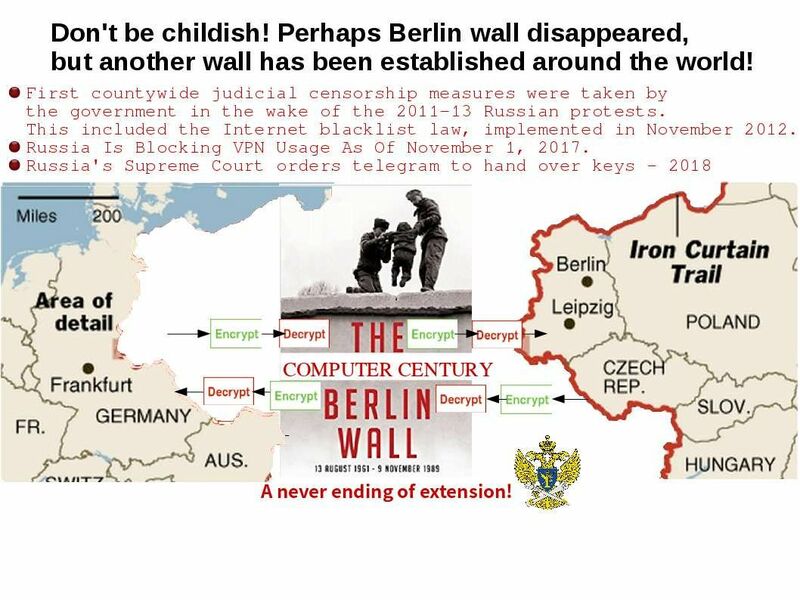 Perhaps Berlin wall disappeared, but another wall has been established around the world! We are focusing censorship policy especially the China great firewall ban VPN and external parties communications. May be we overlook Russia! Russia’s Supreme Court orders telegram to hand over keys this month. Should you have interested of the headline news, please refer below url for reference. 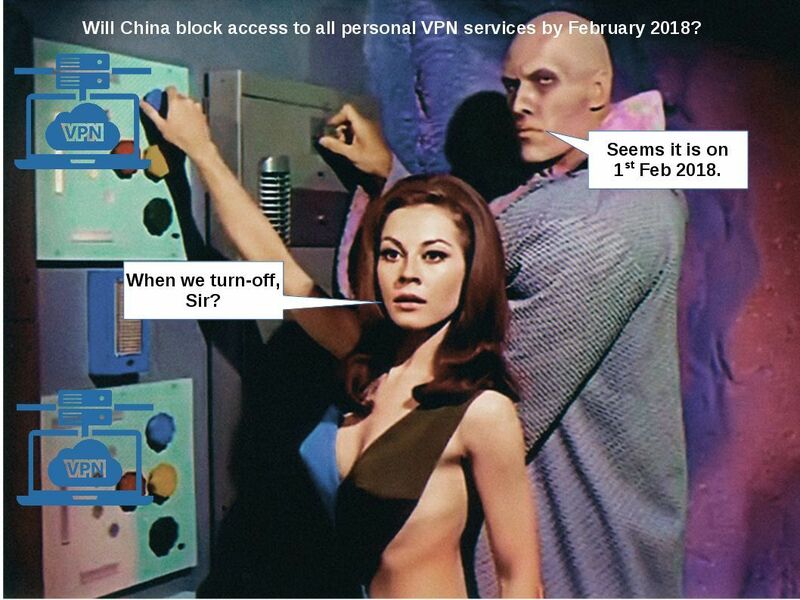 Will China block access to all personal VPN services by Feb 2018? IT guys busy all the time even though at home and therefore sometimes they might forget somethings. There are 2 big things being happen at the end of this month. Heads up that PCI-DSS version 3.1 will be obsolete at the end of the month (31st Jan 2018). The version 3.2 will be effective on 1st Feb 2018.For more details, please refer below url for reference. On the other hand, an official announcement on 2017 told that China moves to block internet VPNs from 2018. Will China block access to all personal VPN services by Feb 2018? For more details, please refer below url for reference. 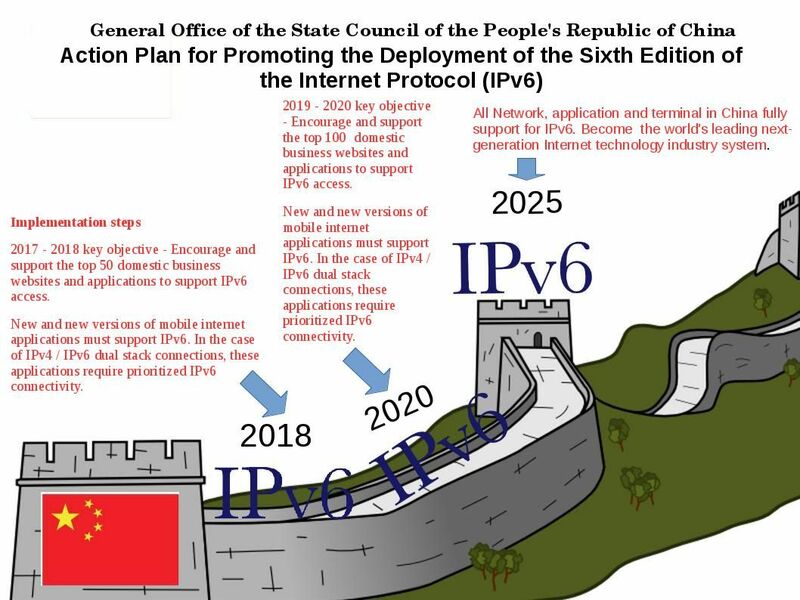 China IPv6 implementation Road map. Will it be burden on current surveillance task? A tough new cyber security law has been in placed in China on June 2017. The United States submitted document to WTO Services Council, said if China’s new rules enter into full force in their current form, as expected by the end of 2018, they could impact cross-border services supplied through a commercial presence abroad. A IP V6 road map announcement by General Office of the State Council of the PRC on 26th Nov 2017. The road map driven whole network, application and computer prioritize IPV6 connectivity.We known that RFC 4941 defining “privacy extensions for IPv6” autoconfiguration. This standard defines a mechanism where a device generates a random host address and uses that instead of the device’s MAC address. As a result it is better to avoid surveillance and tracking. The surveillance program in China has difference comparing with other country. Since monitoring network behavior or so called surveillance is the China government policy. See whether RFC 4941 will be a burden in coming future. It make foreign countries enterprise firm nervous that new cyber security law with effective 1st June 2017. The Article 5 looks with powerful privileges which causes solicitor, data privacy expert headache! Technical support criteria: Such surveillance process not difficult to do. A common network break through technique is man-in-the-middle. 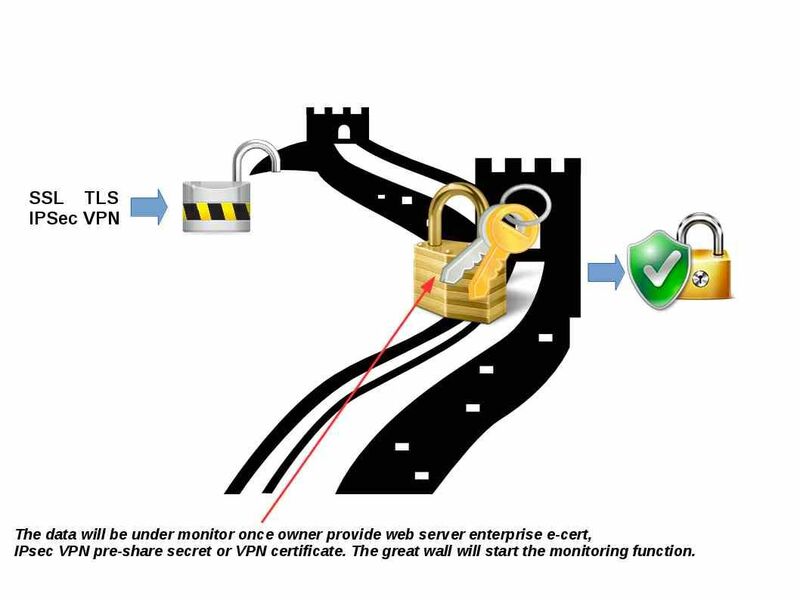 The data will be under monitor once owner provide web server enterprise e-cert, IPsec VPN pre-share secret or VPN certificate. 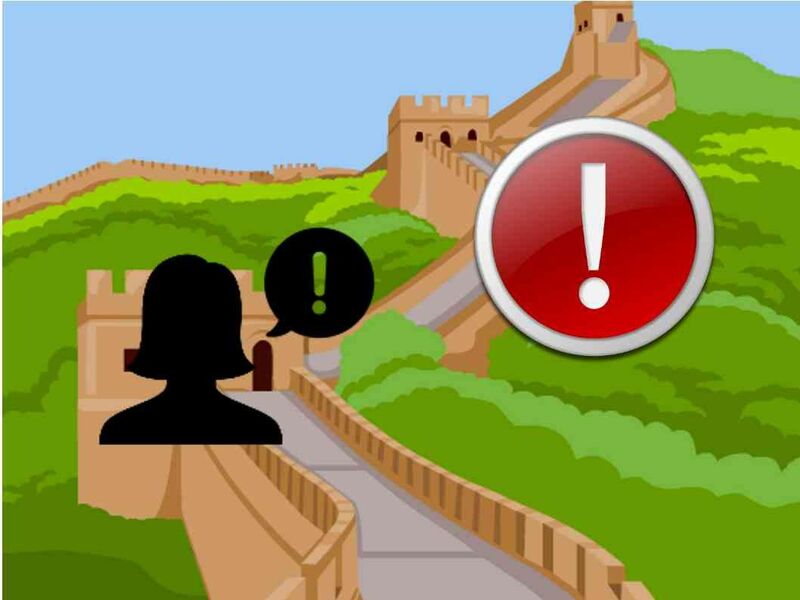 The great wall will start the monitoring function. Not surprised! It required to follow their law once you are going to do the business in China! Below is the cyber security law details for your reference. Article 1 This Law is developed for the purposes of guaranteeing cybersecurity, safeguarding cyberspace sovereignty, national security and public interest, protecting the lawful rights and interests of citizens, legal persons and other organizations, and promoting the sound development of economic and social informatization. 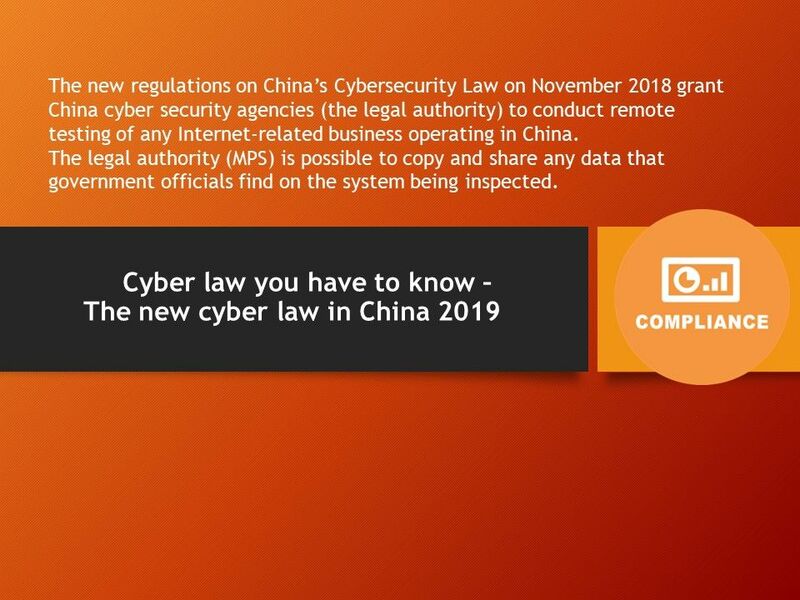 Article 2 This Law shall apply to the construction, operation, maintenance and use of the network as well as the supervision and administration of cybersecurity within the territory of the People’s Republic of China. Article 3 The state shall lay equal stress on cybersecurity and information-based development, follow the guidelines of positive use, scientific development, legal management and security guarantee, promote the construction of network infrastructure and interconnection, encourage the innovation and application of network technologies, support the cultivation of cybersecurity talents, establish and improve the cybersecurity guarantee system, and enhance the capability to protect cybersecurity. Article 4 The state shall develop and continuously improve cybersecurity strategies, specify the basic requirements and major objectives for guaranteeing cybersecurity, and propose cybersecurity policies, work tasks and measures in key fields. Article 6 The state shall advocate honest, faithful, healthy and civilized network conduct, advance the spreading of core socialist values, and take measures to enhance the awareness and level of cybersecurity of the entire society, so as to form a favorable environment for promoting cybersecurity with the participation of the entire society. Article 7 The state shall actively carry out international exchange and cooperation in terms of cyberspace governance, research and development of network technologies, formulation of standards thereof, and crackdown on illegal crimes committed on the network and other aspects, promote the construction of a peaceful, safe, open and cooperative cyberspace, and establish a multilateral, democratic and transparent system for cyber governance. Article 8 The national cyberspace administration shall be responsible for the overall planning and coordination of cybersecurity work and relevant supervision and administration. The competent telecommunications department of the State Council, public security departments and other relevant authorities shall be responsible for cybersecurity protection, supervision and administration within the scope of their respective functions in accordance with the provisions of this Law and other relevant laws and administrative regulations. Article 9 Network operators shall, when conducting business operations and providing services, abide by laws and administrative regulations, respect social morality, observe business ethics, have good faith, perform the cybersecurity protection obligation, accept supervision by the government and the public, and undertake social responsibilities. Article 10 For the construction and operation of the network or the provision of services through the network, technical measures and other necessary measures shall be taken in accordance with the provisions of laws and administrative regulations and the compulsory requirements of national standards to ensure the safe and stable operation of the network, effectively respond to cybersecurity incidents, prevent illegal criminal activities committed on the network, and maintain the integrity, confidentiality and availability of network data. Article 11 Network-related industry organizations shall, in accordance with their charters, intensify industry self-discipline, formulate codes of conduct on cybersecurity, direct their members to strengthen cybersecurity protection, raise the level of cybersecurity protection, and promote the sound development of the industry. Article 12 The state shall protect the rights of citizens, legal persons and other organizations to use the network in accordance with the law, promote the popularity of network access, provide better network services, provide the public with safe and convenient network services, and guarantee the orderly and free flow of network information in accordance with the law. Any individual or organization using the network shall comply with the Constitution and laws, follow public order and respect social morality, shall not endanger cybersecurity, and shall not use the network to conduct any activity that endangers national security, honor and interest, incites to subvert the state power or overthrow the socialist system, incites to split the country or undermine national unity, advocates terrorism or extremism, propagates ethnic hatred or discrimination, spreads violent or pornographic information, fabricates or disseminates false information to disrupt the economic and social order, or infringes upon the reputation, privacy, intellectual property rights or other lawful rights and interests of any other person. Article 13 The state shall support the research and development of network products and services that are conducive to the healthy growth of minors, legally punish the activities that damage the physical and mental health of minors by using the network, and provide a safe and healthy network environment for minors. Article 14 Any individual or organization shall have the right to report the conduct that endangers cybersecurity to the cyberspace administration, telecommunications department, public security authority, and other departments. The department that receives the report shall handle such a report in a timely manner in accordance with the law, or transfer the report to the competent department in a timely manner if it falls outside its responsibility. The relevant department shall keep confidential the information on the informant, and protect the informant’s lawful rights and interests. Article 15 The state shall establish and improve the system of cybersecurity standards. The standardization administrative department of the State Council and other relevant departments of the State Council shall, according to their respective functions, organize the formulation of and revise at appropriate time national and industry standards relating to cybersecurity administration and the security of network products, services and operations. The state shall support enterprises, research institutions, institutions of higher learning, and network-related industry organizations in participating in the formulation of national and industry standards on cybersecurity. Article 16 The State Council and people’s governments of provinces, autonomous regions and municipalities directly under the Central Government shall make overall planning, increase input, support key cybersecurity technology industries and projects, support the research, development and application of cybersecurity technologies, popularize safe and reliable network products and services, protect the intellectual property rights of network technologies, and support enterprises, research institutions, and institutions of higher learning, among others, in participating in national innovation projects on cybersecurity technologies. Article 17 The state shall boost the construction of a socialized service system for cybersecurity, and encourage relevant enterprises and institutions to provide such security services as cybersecurity authentication, detection and risk assessment. Article 18 The state shall encourage the development of technologies for protecting and using network data, promote the availability of public data resources, and promote technological innovation and social and economic development. The state shall support the innovation of cybersecurity management methods and the application of new network technologies to enhance cybersecurity protection. Article 19 People’s governments at all levels and their relevant departments shall organize regular cybersecurity publicity and education, and direct and urge relevant entities to conduct cybersecurity publicity and education in an effective manner. 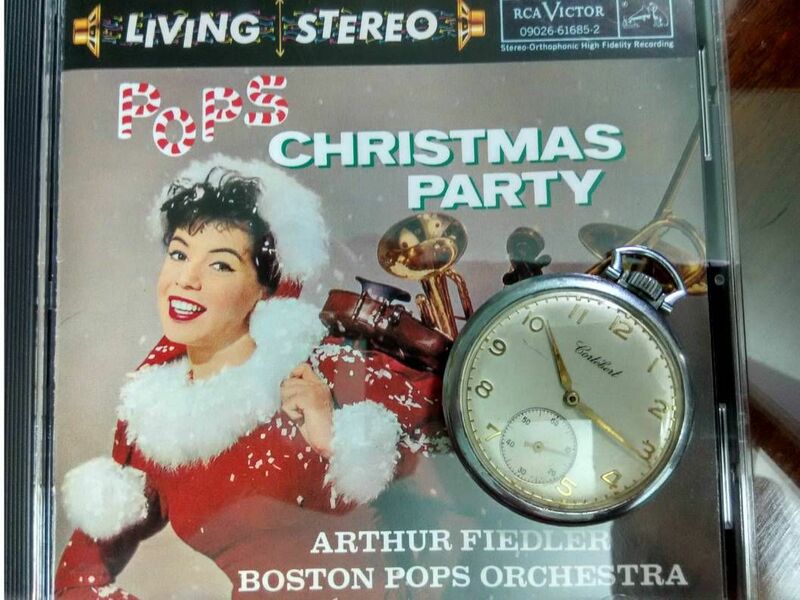 Mass media shall offer pertinent cybersecurity publicity and education to the public. Article 20 The state shall provide support to enterprises, institutions of higher learning, vocational schools and other education training institutions to conduct cybersecurity-related education and training, take multiple means to cultivate cybersecurity talents, and promote the exchange of cybersecurity talents. Article 21 The state shall implement the rules for graded protection of cybersecurity.Network operators shall, according to the requirements of the rules for graded protection of cybersecurity, fulfill the following security protection obligations, so as to ensure that the network is free from interference, damage or unauthorized access, and prevent network data from being divulged, stolen or falsified. (1) Developing internal security management rules and operating procedures, determining the persons in charge of cybersecurity, and carrying out the responsibility for cybersecurity protection. (2) Taking technical measures to prevent computer viruses, network attack, network intrusion and other acts endangering cybersecurity. (3) Taking technical measures to monitor and record the status of network operation and cybersecurity incidents, and preserving relevant weblogs for not less than six months as required. (4) Taking measures such as data categorization, and back-up and encryption of important data. (5) Performing other obligations as prescribed by laws and administrative regulations. Article 22 Network products and services shall comply with the compulsory requirements of relevant national standards. Providers of network products and services shall not install malware. When a provider discovers any risk such as security defect and vulnerability of its network products or services, it shall immediately take remedial measures, inform users in a timely manner, and report it to the competent department in accordance with relevant provisions. Providers of network products and services shall continuously provide security maintenance for their products and services, and shall not terminate the provision of security maintenance within the stipulated period or the period agreed upon by the parties. Where network products and services have the function of collecting users’ information, their providers shall explicitly notify their users and obtain their consent. If any user’s personal information is involved, the provider shall also comply with this Law and the provisions of relevant laws and administrative regulations on the protection of personal information. Article 23 Key network equipment and specialized cybersecurity products shall, in accordance with the compulsory requirements of relevant national standards, pass the security certification conducted by qualified institutions or meet the requirements of security detection before being sold or provided. 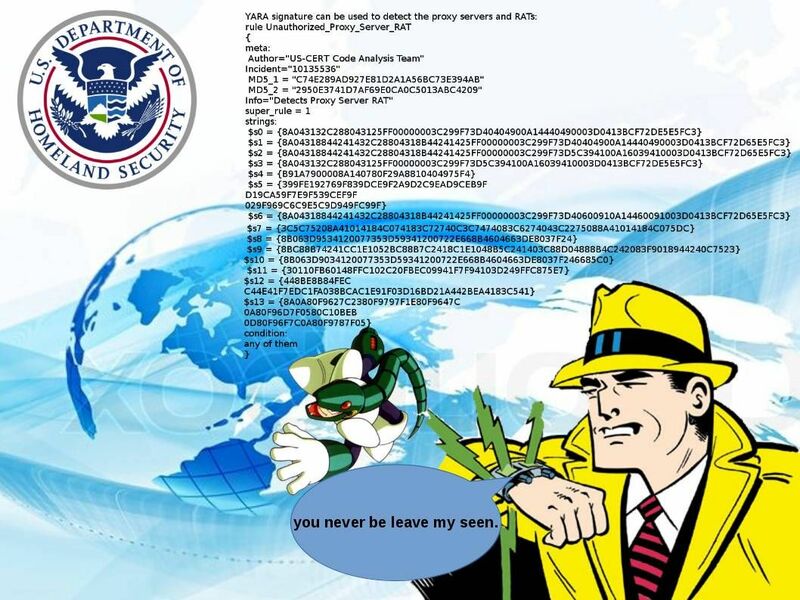 The national cyberspace administration shall, in conjunction with relevant departments of the State Council, develop and release the catalogue of key network equipment and specialized cybersecurity products, and promote the mutual recognition of security certification and security detection results to avoid repeated certification and detection. Article 24 Where network operators provide network access and domain registration services for users, handle network access formalities for fixed-line or mobile phone users, or provide users with information release services, instant messaging services and other services, they shall require users to provide true identity information when signing agreements with users or confirming the provision of services. If any user fails to provide his or her true identify information, the network operator shall not provide him or her with relevant services. The state shall implement the strategy of credible identity in cyberspace, support the research and development of safe and convenient technologies for electronic identity authentication, and promote mutual recognition among different electronic identity authentication technologies. Article 25 Network operators shall make emergency response plans for cybersecurity incidents, and deal with system bugs, computer viruses, network attack, network intrusion and other security risks in a timely manner. When any incident endangering cybersecurity occurs, the relevant operator shall immediately initiate the emergency response plan, take corresponding remedial measures, and report it to the competent department in accordance with relevant provisions. Article 26 Such activities as cybersecurity authentication, detection and risk assessment shall be conducted, and cybersecurity information on system bugs, computer viruses, network attack, and network intrusion, among others, shall be released to the public in accordance with relevant provisions of the state. Article 27 No individual or organization may conduct any activity endangering cybersecurity, such as illegally intruding into any other person’s network, interfering with the normal functions of any other person’s network, and stealing network data, or provide programs or tools specifically used for conducting activities endangering cybersecurity, such as network intrusion, interference with normal functions and protective measures of the network, and stealing of network data. Whoever knows that any other person conducts any activity endangering cybersecurity shall not provide technical support, advertising promotion,payment and settlement services or any other assistance to such a person.